It's the start of berry season here in Texas, and one of my favorites is blueberries. I love them in my yogurt, oatmeal, jam, pies—you name it. Unfortunately, many of the berry farms in a two hour radius from me suffered a late spring freeze and little rainfall. I was jazzed to visit a pick-your-own farm and fill a gallon sized bucket for about $1.25 a pound. No such luck. Of course the weather issues won't halt my blueberry obsession. As I'm accustomed in both Kansas and Texas, when the temps are soaring past 100 degrees and the humidity drenches me in less than five minutes, I look forward to shady evenings, lightning bugs, and a cool beverage (or five). Sometimes it's iced tea, other times it's lemonade. When I'm feeling particularly motivated, I make cocktails with fresh fruit and herbs. It's one of life's little pleasures. Crushed mint and basil can elevate a drink from a 4 out of 10 to a 20. I used to make "foo-foo" (as my dad calls it) blueberry and lemonade martinis back in Kansas City for my sister and friend who is currently hiking the PCT. To give it more oomph, I used blueberry vodka from the liquor store, but at $20-25 a pop with minimal blueberry flavor it was kind of a rip-off. Not to mention the fact that the blueberry flavor was probably artificial. The same brand was also pumping out bottles of bubblegum and whipped cream flavored vodka, so that would be my guess. Thankfully, you can make infused alcohol at home with hardly any effort. Snag your favorite vodka (it can be as inexpensive or pricey as you like), whatever fresh fruit and herbs float your boat, a clean mason jar, and you're 95% there. The biggest factor is time. Two to three weeks minimum for the alcohol to infuse. Longer if you'd like a stronger blueberry flavor. Buy a 1.75 liter container of vodka and use the rest of it to make homemade vanilla extract and peppermint extract for the holidays. The vodka will be less expensive and you won't have to buy expensive extracts this winter. Plus, they make fantastic homemade gifts. Although it's awesome to find locally sourced fruit in-season, frozen fruit is perfectly acceptable. 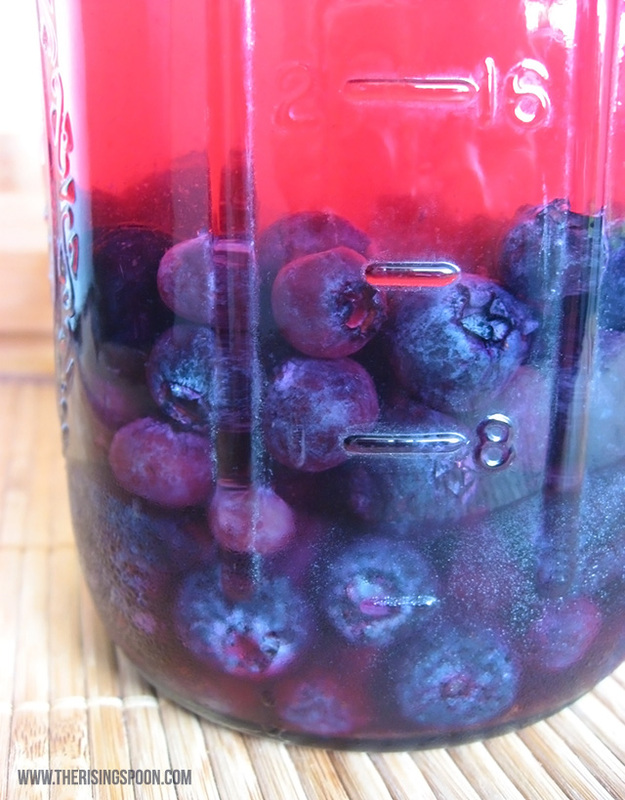 This allows you to make infused alcohols all year long and in the case of blueberries, actually improves the flavor. I've heard whispers around the web that freezing blueberries causes them to expand and contract, improving the flavor and juiciness once they're thawed. Seems legit to me. I have to confess that I've wanted to infuse vodka with fresh fruits for years. I used to talk to my friend in KC about it (she's a mixologist) every summer and kept putting it off. Don't be like me and procrastinate! It's SOOO easy. And worth it. Buy the alcohol, fruit, and a clean jar. Mix it, store it, wait, and DONE. 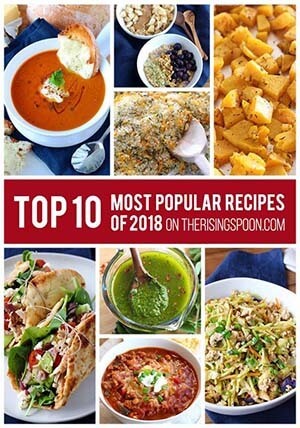 With a little effort you can enjoy delicious infused vodka recipes all year long. Make sure to stay tuned. In the next month or so after this batch is done infusing, I'll post my blueberry vodka lemonade cocktail recipe. 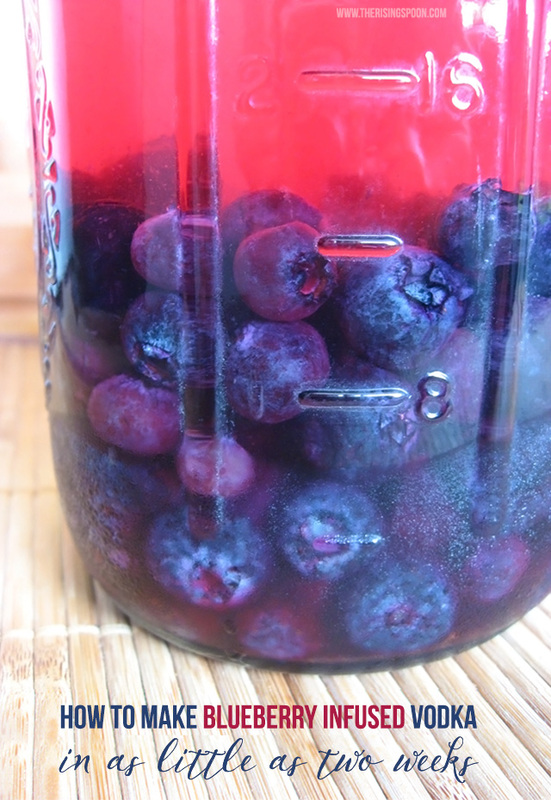 Learn how to combine vodka with fresh or frozen blueberries to create a delicious infused vodka in as little as two weeks. Perfect for summertime cocktails like blueberry vodka lemonade with fresh herbs and juices. Note: I recommend using organic blueberries, if possible. Conventional blueberries routinely test for high amounts of pesticides and end up on the Dirty Dozen list. If you're using fresh blueberries, wash and dry them thoroughly. If they're frozen, let them thaw completely in a bowl. 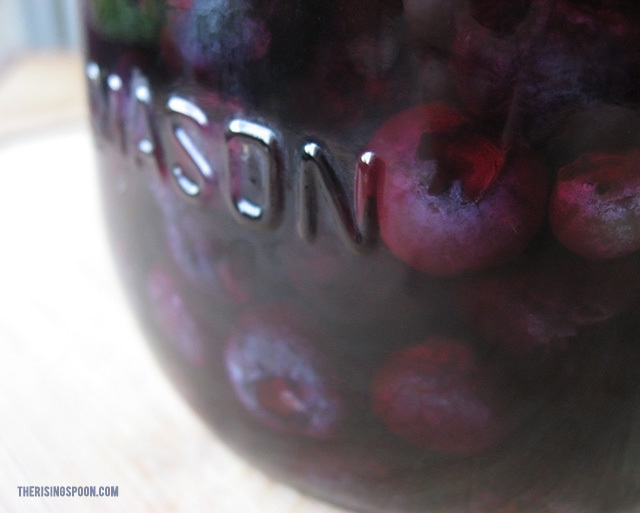 Dump the berries into a clean mason jar, along with any juice that has formed at the bottom (if you're using frozen). Using a muddling tool or large wooden spoon, mash the blueberries a few times to release the juices. Pour the vodka over the blueberries so that they're completely covered with alcohol. A good rule of thumb is to use twice as much vodka as blueberries. So if you're making a huge jug, just measure the blueberries and double that amount for the vodka. Seal the jar with a tight fitting lid, give it a good shake and place in a cool, dark place like a cabinet or closet to infuse. Check it after a few hours to see if there are any blueberries floating. If so, toss the floaters. The alcohol has to be covering them to keep them preserved. We don't want any mold forming. Let the mixture infuse for a minimum of two weeks. I think at least a month would be ideal, although you can always open and it and taste a tiny bit to see what you think. Once it's ready to use, strain out the infused vodka through a coffee filter or cheesecloth into a clean jar. Discard the blueberries or save for other recipes. Store the filtered blueberry vodka in the freezer for best taste and shelf life. Should last at least a year! Save the strained blueberries for baking into muffins or freeze into ice cube trays with water, juice, lemonade, etc. for flavoring drinks! Since you'll be drinking this vodka (instead of baking with it like vanilla extract), I recommend buying a mid-grade vodka, or at least opting with one that you know tastes good.